For those who want an awning designed for fixed use, our best selling Motor Rally and Motor Ace awnings provide fantastic accommodation and are easy to set-up and take down. All our fixed awnings use inflatable poles. They all come complete with twin beading that can either be fed through the awning rail attached to your vehicle or threaded through the channel in the front of roll-out awnings. If you have a larger motorhome sometimes you just want to stay put for a while. Our Motor Rally AIR and Motor Ace AIR models will fit the bill. They attach to your vehicle, either attaching to the roll out awning or to an awning rail fitted directly to the motorhome. They come complete with 4mm and 6mm keder (beading) so they can be fitted to most popular roll out awnings. They all come complete with specially designed rear upright poles that keep the rear of the awning close to side of your motorhome. This can be further improved by using our new Limpet Fix System that attaches the side of the awning to the motorhome(Smooth walls only). These awnings are available in a variety of heights to suit a majority of motorhomes, just measure the height from the ground to the slot in the front of your roll out awning or awning rail. They’re easy to fit to a roll out awning, wind the awning out to a convenient height, feed the awning into the slot on the front rail and then roll the awning back up – easy. 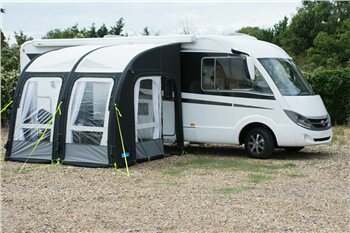 Updated for the 2018 season, the Motor Rally AIR Pro has been incredibly popular and now features a new connection method to protruding roll out awnings that allows the awning to sit flat against the motorhome. It brings even more features and makes sure that the Motor Rally AIR Pro is market leading. Available in 260 and a brand new 330 size, the Motor Rally AIR Pro is also available in three different heights – L, XL and XXL to suit different height motorhomes. The Motor Rally AIR Pro uses our fantastic Weathershield™ Pro material for excellent weatherproofing and long life but is still light enough for easy set up and handling. The front panels roll to the side or can be used ‘veranda’ style. Look out for our fantastic zip in front mesh panels that are available as optional equipment. Overall an excellent awning, a perfect size for our motorhome. The fit around our Fiamma awning is not perfect and the fitment of the rear poles is very confusing, this should be better described in the instruction manual. The instruction manual is poorly illustrated, very confusing.